"Cindy Ann Kennedy, Westbrook College, Class of 1978"
Westbrook College student Cindy Ann Kennedy, Class of 1978, was a Fashion Merchandising major and lived in Proctor Hall. 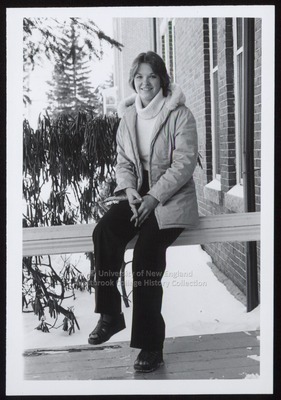 For her senior class candid photo, which appeared in the 1978 Tower Yearbook, she wore dark slacks, a pale turtle neck sweater, and a pale winter jacket with fur lined hood. Her shoes were open-toed platform sandals. Her light hair was parted in the middle and feathered back on the sides. Cindy Ann sits on the railing at Hersey Hall with snow and Goddard Hall's main entrance as her background.